The L.L.Bean fishing weekend was a great success with many people in attendance. There were a lot of great exhibits, presentations and lots of great gear to get ready for spring! CCA-Maine had the opportunity to talk with folks about the Snap-a-Striper Program at their booth. During the event, CCA-Maine was presented with a generous donation from Dan Tarkinson and Fly Fishing in Maine for the Snap-a-Striper Program. 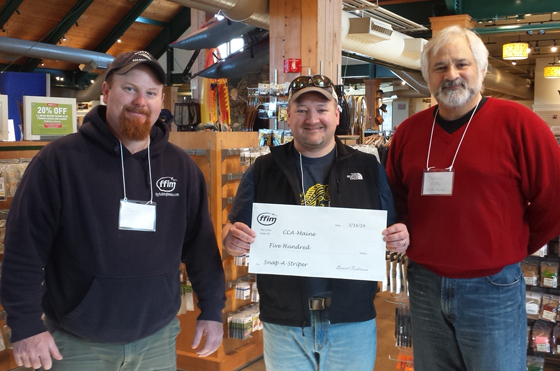 Ben Redmond of Fly Fishing in Maine presented a $500 check to CCA-Maine Treasurer, Dominic Vella and CCA-Maine Board Member, Dave Huntress. Fly Fishing in Maine is a nonprofit organization dedicated to promoting, protecting and preserving Maine’s fisheries. It does this in a variety of ways, primarily sharing its passion with others, introducing new people to the sport, and conducting and funding conservation projects through the state. Each year Fly Fishing in Maine hosts “The Fly Fishing Film Tour”, a series of short, action–packed films whose main characters include tarpon and brook trout with winding rivers, Caribbean flats and other locales supporting the main cast. Always entertaining for both plot and action, the tour is a different entity each year, varying in film destinations and film subjects. This year was the 5th year the event was held at the Frontier in Brunswick and it also included an “Iron Fly” fly tying contest. Check out their website next winter and watch for the announcement. This event sells out fast every year so be sure to follow Fly Fishing In Maine on Twitter or look for information on their website at www.flyfishinginmaine.org.